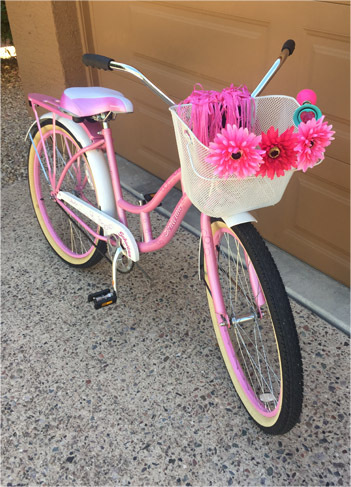 You would love my cute pink bike with my pink pom-poms hanging over the handle bars and big gerbera daisies in different shades of pink clipped on the front of my bicycle basket. Oh, and I also have a honking pink horn on the basket! If I add too many more accessories, I’ll have to add a side extension to the bike. Ever since a good-Samaritan-friend graciously fixed my bicycle tire leaks, I can, as the song says, “ride like the wind” all over my neighborhood. Funny how my bike seems to glide with ease and little effort when there is air in the tires! With the MapMyRun app on my phone, I can run, walk, or cruise and know how many miles I’ve traveled and how long it took to pedal my way back home. I’ve actually mapped out a cool three-mile ride around my neighborhood. Believe it or not, the last mile ends up through my church parking lot. I can pull in off the street, starting at the beginning of the parking lot’s first lane, and go the full length of each lane, winding up and down all the way to the last lane ― and it’s one mile! Who knew? There’s something special about riding a bike. (As there is about walking, both of which I love to do.) I know it’s my imagination, but I feel like I could reach up and touch the trees as the sunlight glistens through the branches. I love to be sitting up high, it seems I get a different perspective on everything around me. When steering my bike, the need to focus helps to clear my mind when my heart is heavy over a situation, or when I’ve had a stressful day. Sometimes when I have to go around a hole in the pavement, or hit a bump in the road, it is a reminder to me that life is full of holes and bumps ― much like the unexpected, uncontrollable situations that happen in life. All the more reason to keep my focus on Jesus and trust Him. So… do you want to know what I actually do on my bike? I pray as I pedal. It’s the perfect opportunity, without interruptions, to pray for those on my prayer list. And what about the pom-poms? Well, you never know who might need encouraging along the way. They always bring a smile when I see a neighbor and wave my pom-poms as I ride by. By now, you probably feel like you’ve ridden with me on the back of my bike, holding on for dear life. Perhaps you’ve learned a few insider things about my three-mile ride. The next time you go on a walk, run, hike, or ride your bike, you might think about having a “Zacchaeus moment” too. Perhaps you are going through a heartbreaking situation, a broken relationship, or circumstances beyond your control. Just like Jesus saw Zacchaeus in a crowd of people, He sees you too. You are not forgotten. You are not alone. He’s got His eye on you. In fact, He could be calling your name right now, but you’ve been too busy and too preoccupied with getting through each day to focus on Him and listen for His voice. Rise above the chaos around you and keep your eyes on Jesus. He can change your life and perspective forever. Love this! Love you…. just read this to Amber and I swear I tried to sound Southern! ? Love this perspective. When we focus on our situation, we end up in the ditch. 2 hands little Miss. “He’s got His eye on you. 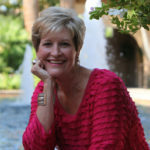 In fact, He could be calling your name right now, but you’ve been too busy and too preoccupied with getting through each day to focus on Him and listen for His voice.” You hit the nail on the head. Thank you!